The gorgeous Uzbekistan-American actress, Milana Vayntrub has probably remembered for her appearance as a saleswoman in the AT&T commercial and movie Life Happens. Vayntrub does have a fascinating professional career but her dating life has been a matter of interest to all her fans yet she remains very secretive about it. Does she have a boyfriend or is secretly married? Dating Life Of Uzbekistan-American Actress Milana Vayntrub: Dated John Mayer? Milana Vayntrub has been very much under the rocks about her love life! The 31-years-old beautiful actress is all secretive when it comes to her personal life. Vayntrub has not been spotted or seen with anyone lately so we cannot assure whether she is currently dating anyone or not. However, it's not that she has been out romanticism for too long. Several rumors reported that she was in a relationship with the famous singer and songwriter John Mayer. Reports claimed that they dated in 2006 and were together for a few months. Their relationship went well for a couple of months and eventually decided to split apart. There is no record of Vayntrub's relationship since John as she has not been much open about her love life to the public. She once posted a picture on her Instagram where a guy is kissing her in the cheeks but the face is covered up by the actress's face so we could not figure it out who he actually was. Many rumors claimed that he might be John Mayer but the rumors are still not confirmed. She is active on her Instagram and regularly updated about her daily life to her fans. The actress has an incredible number of friends as she is often seen hanging out with her friends. The actress has been busy with her professional life and has been scheduled to do a voice role in the movie Marvel's New Warriors in a lead role. No further details about her personal life have been out to the public and let us hope that we hear some good news about her relationship pretty soon. 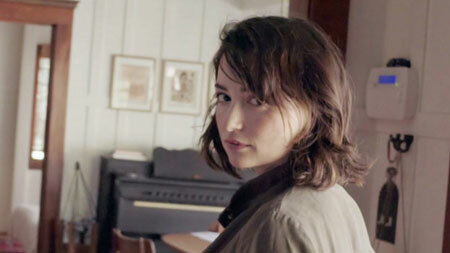 Milana Vayntrub's Rise To Limelight!! Vayntrub first debuted her career with a Youtube comedy channel Live Prude Girls teaming up with Stevie Nelson and produced various short series including Let's Talk About Something More Interesting. She has then starred in several movies including Life Happens and has starred in various CollegeHumor videos. Vayntrub was also in the lead of music video for Teenage Tide by Letting Up Despite Great Faults and appeared as Tara in two episodes of Silicon Valley. Milana is widely known for her portrayal as a saleswoman named Lilly Adams for AT&T. She went to Greece and met with refugee families who flew from the Syrian Civil War and co-founded a website name CantDoNothing to bring the European migrant crisis to spotlight. She was born on 8 March 1987. Her birthplace is Tashkent, Uzbekistan. Moved to Los Angeles with her parents at age three. Acted in Mattel Barbie commercials at age 5 due to family's financial problems. Earned her bachelors of Arts in Communications from the University of California. Stands at the height of 5 feet 3 inches and weighs about 53 kgs.